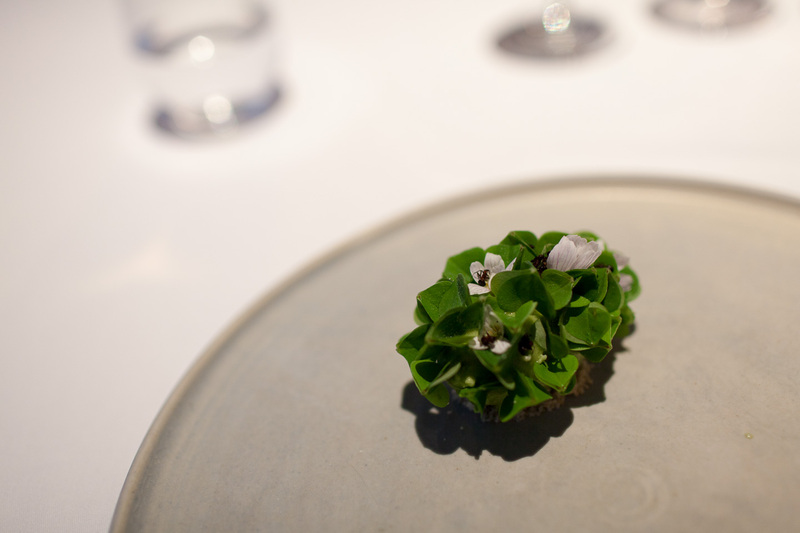 Maaemo is an old Finnish word for “Mother Earth” that together with sommelier and co-owner Pontus Dahlström is the restaurants only connections to Finland. Everything else is about Norway and bringing the Norwegian nature to the plate. 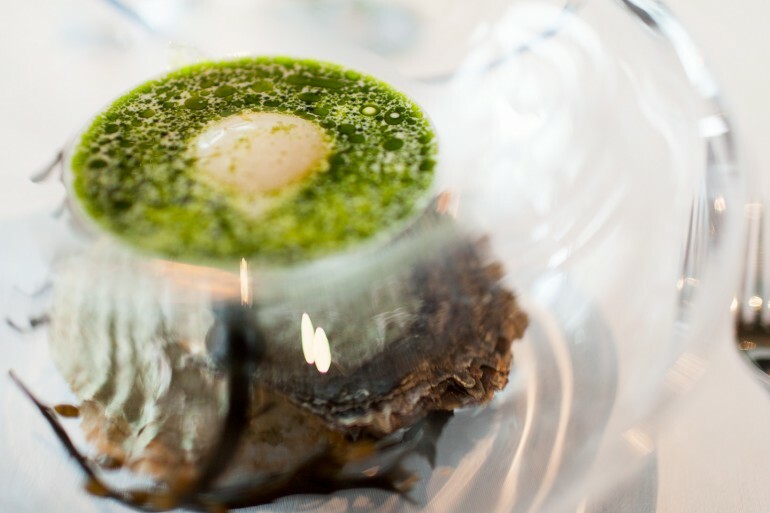 Maaemo takes ideas from the New Nordic Cuisine movement and presents them in its own unique way. The 20-odd course tasting menu is built around local ingredients that reflects the changing seasons and rawness of the Norwegian nature. It was opened in 2010 and has quickly risen to international acclaim since then. Maaemo received two Michelin stars in 2012 and is listed as the World’s 64th best restaurant in 2015. Head chef and also co-owner Esben Holmboe Bang has been listed as one of the world’s most influential chefs and is the main driving force behind the use of organic, biodynamic and wild ingredients. The restaurant has become very popular and you have to book in advance to get a seat, way in advance if you want to go on a Friday or Saturday evening. The surroundings are as modern and exciting as they come and provide a fantastic contrast to the cuisine. The restaurant is located in the glass building of the new Police house with views over the bridge that leads to the Barcode development. Inside there’s eight tables in the main dining room and a kitchen table overlooking the chefs on the second floor. The interior is very Danish in style and almost a little too spartan, and I get the feeling that there’s something missing to pull off such a paired back design. The corners looks very empty and it’s a little too much painted surfaces for me. 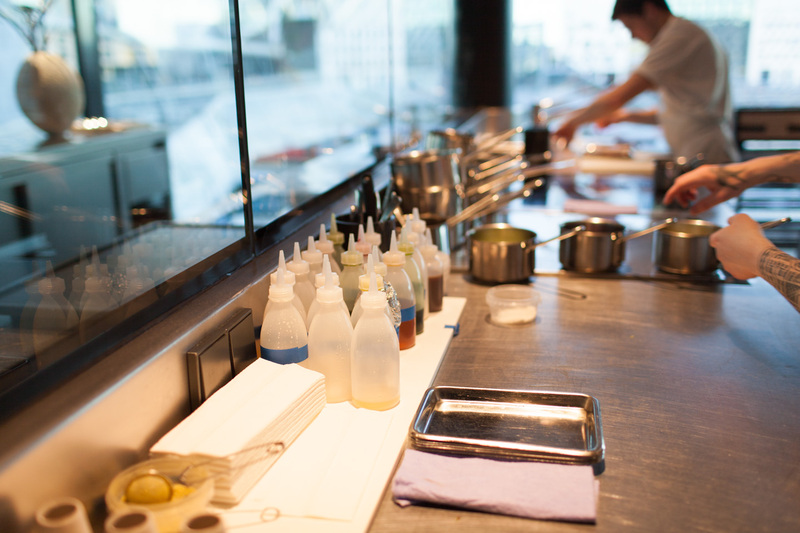 The glass walled kitchen is on the second floor, allowing the chefs to look out over the dining room. It brings up the design factor and works very well. Even though there’s just a few tables there’s a silent, constant ballet of the waiting staff, and chefs, running up and down the stairs to bring down the food. 25 presented courses has that effect. 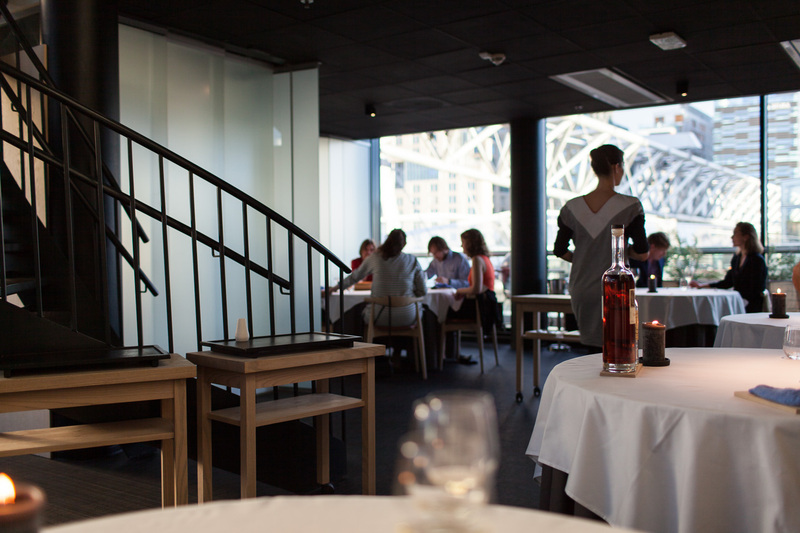 The seasonally changing tasting menu costs 2050 NOK with a wine pairing at 1390 NOK. The number of courses and wines will vary slightly throughout the year depending on the produce and ingredients available. We had 10 wines and one beer as part of our package. Cocktails, a non-alcoholic juice package and a comprehensive wine list is also available if you want an alternative to the wine pairing. Oyster emulsion with mussel and dill sauce. A couple of snacks in quick succession start off the menu; we were served fresh cheese with vendance roe, salsify pickled in juniper, a cracker made from dehydrated beer served with egg yolk, cured wild duck, a savory cookie made from chanterelles and finally a cornett with chicken liver and an elderflower jam. Of these dishes the chanterelle cookie and chicken liver cornett stood out. For someone that has a bit of a consistency problem with chanterelles the dish stood out in a very positive way with incredibly deep flavors and nice textures. The liver dish was a Nordic take on the foie gras with mango pairing that worked beautifully. Consistent throughout the meal was the attention to textures and mouth-feel. Every emulsion and mousse was incredibly smooth and rich with flavor. Among the next couple of pre-starters (before the wine pairings began) was one of the signature dishes on Maaemo’s menu, the raw oyster emulsion served with a warm sauce made from mussels and dill. This is the by far best rendition of oysters I’ve seen to date that lifts them to a proper, enjoyable dish. Bitter greens with garlic mustard and yogurt whey. Next up was one of the real highlights, if not the best dish, of the entire evening. 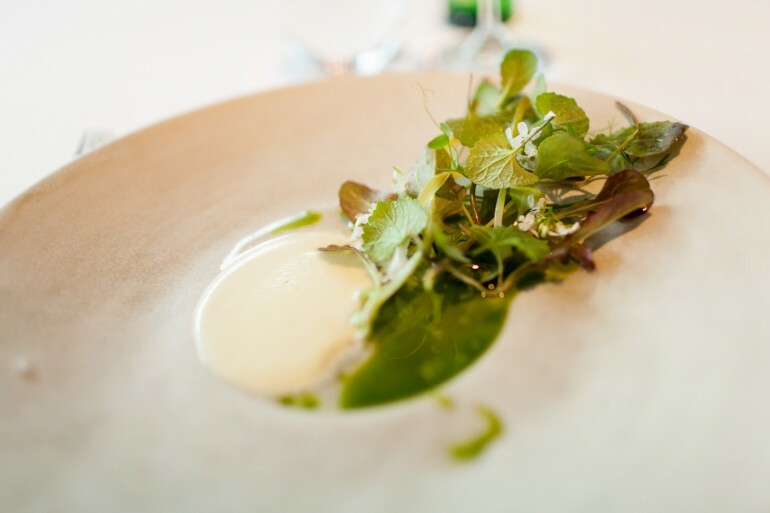 A simple, beautiful salad made from bitter greens with garlic mustard and yogurt whey. It was served with a vinaigrette that I think was based on the garlic mustard and combined it was vibrant, exciting and soothing at the same time. The most theatrical dish was a langoustine tail served on a bed of spruce needles. Pickled spruce concentrate and rapeseed oil was poured over dry ice setting off a cloud of pure forest scent. This was followed by a langoustine claw with gosefoot and goats milk that was a bit too salty for my taste. These were the first two courses that had a wine pairing, a 2011 Ratzenberger Riesling Spätlese. The next four dishes were all spectacular by their own and together with the bitter green salad some of the best I’ve ever eaten. A scallop grilled in its own shell is masterfully paired to soft celeriac baked in salt, small apple disks and a broth made from celeriac and smoked butter. The most perfect small sourdough bread puffs with a crunchy outside and deep flavor made from emmer, one of the first forms of cultivated wheat. Lightly picked mackerel served with ramsom, tender elmshoots, apple purée and a tingy, acidic broth. 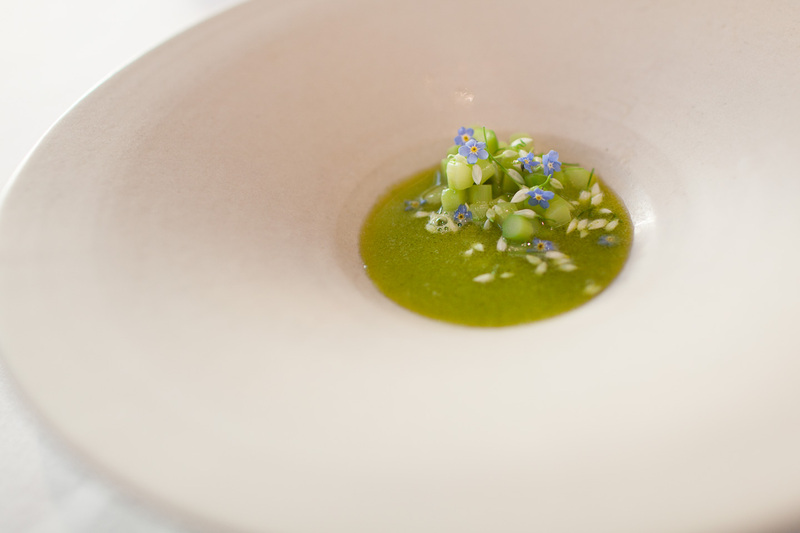 The first asparagus of the short Norwegian season, one of the sweetest dishes I’ve ever seen, was served with blue Myosatis sylvatica flowers and nettles. I cannot stress how good these dishes were. 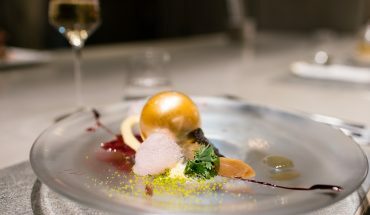 They really brought the Norwegian countryside onto the plate together with balance, excitement and sophistication. One of the finest wine pairings was also made to the asparagus, a sauvignon blanc in the form a 2012 Domaine de la Solitude from Pessac-Léognan, Bordeaux complemented it perfectly and enhanced both the flowery notes and provided a mineral driven background. Sauvignon blanc and asparagus is a classic and scientific pairing, but it works so well. 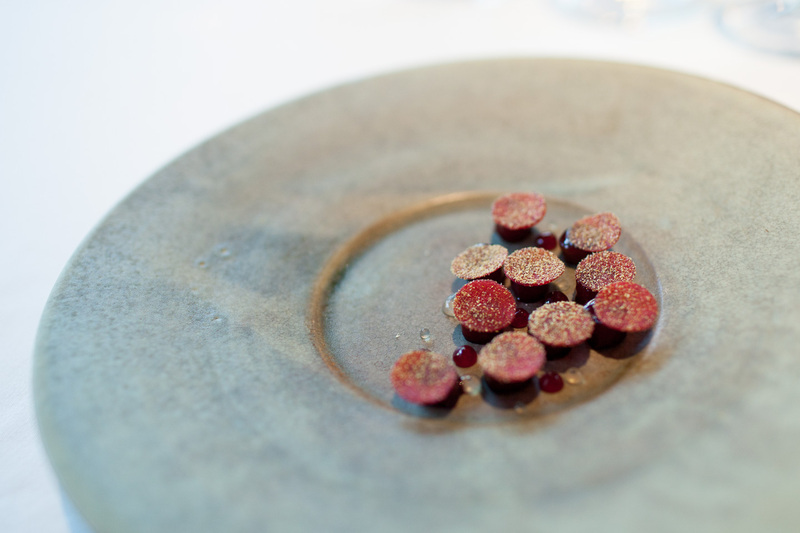 Beets glazed in currant and chamomille and a savory version of Rømmegrøt with brown butter and dried reindeer heart sweeps by and then we reach the main meat course. 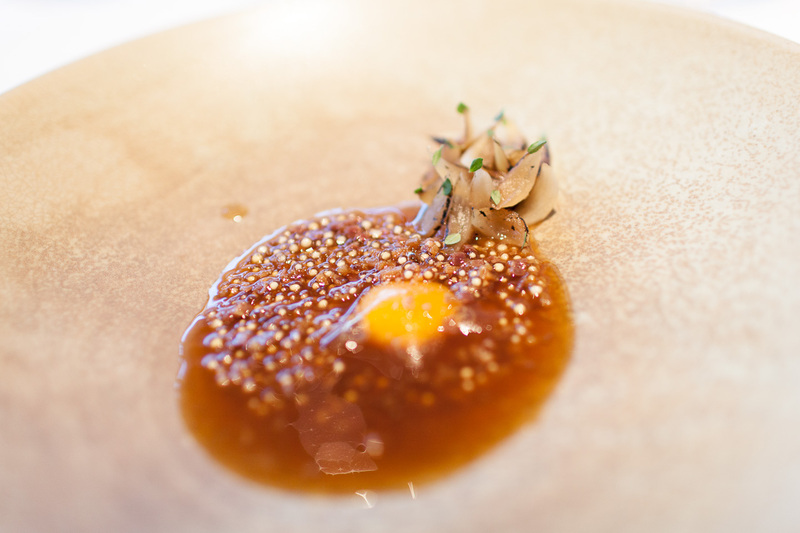 A quail egg cooked in roasted bone marrow, charred onions and a vinaigrette with aged fenalår (air dried leg of lamb) provides the most intense, hearty dish that takes “pinnekjøtt” to the next level. The only red wine of the evening is served to this dish, 2000 Vina Tondonia from Rioja that brought a nice brightness to the overall dish. 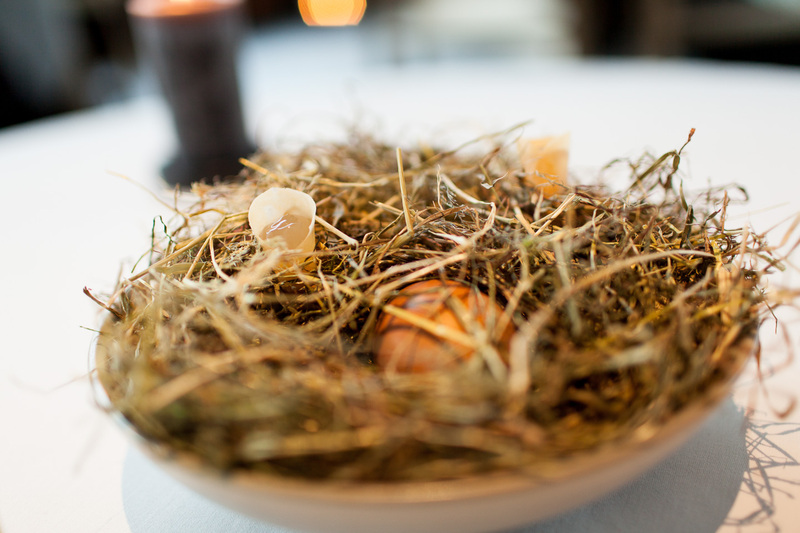 Onion, fenalår and quail egg. The fenalår-dish felt like something of a crescendo before a different journey of the evening began. We were given a little time to finish our wine and to take a look in the kitchen that showed the same silent, coordinated ballet as the dining room. A nitrogen freezed blue cheese course with mushrooms provided a break before the sweet act. The cheese became airy, very light and worked differently from most other cheese courses I’ve had. But I don’t care for blue cheese at all so I’m the wrong person to judge it. 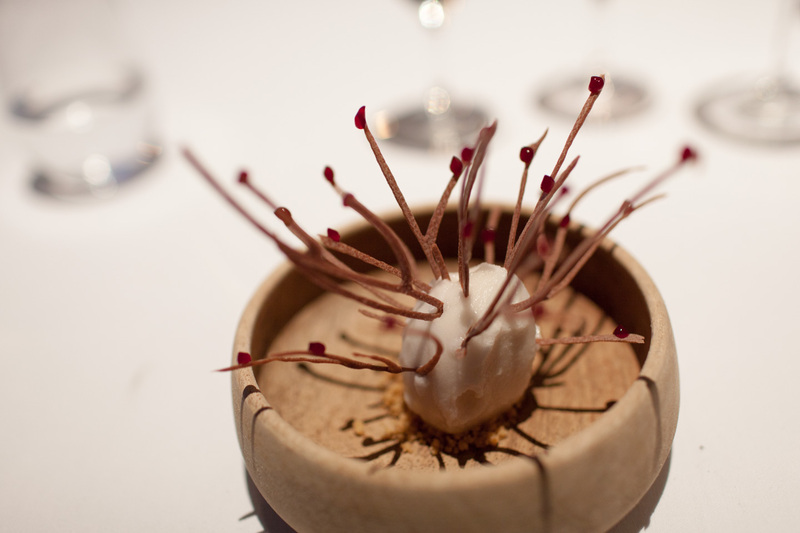 First of the desserts was a sorbet clad in wood sorrel served with wood ants for small bursts of acidity. The leaves provided more of a texture than the ants which really did provide something for the dish, so even for someone who isn’t much into entomophagy it worked well. Smell of black currant sorbet. Next cold dessert was the “smell of the black currant bush”, a sorbet infused so that it tasted just like the smell of a black currant bush. For someone who grew up with a black currant hedge on the yard this was a spectacular dish that really brought the emotional game to the meal. 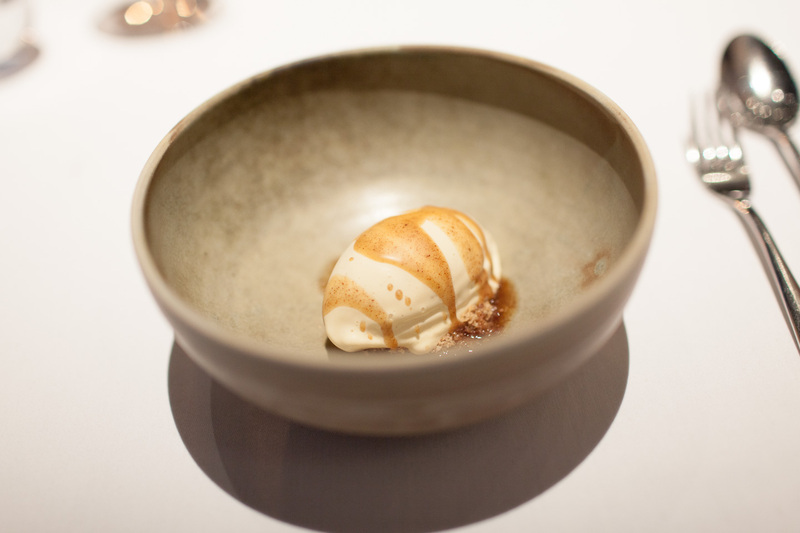 Another of Maaemos signature dishes followed: brown butter icecream. If you’re as enthusiastic as me (or Heston Blumenthal) about brown butter then this dish is for you. While not as conceptually strong or as sparkling as some of the other dishes, it definitely was one of the most sober and easiest to just enjoy. To finish it all off we were served a series of classic Norwegian sweet dishes. A liquid waffle provided the same kind of false sensation as the black currant sorbet but in the form of a liquid-filled praline. A tart made from the caramelized goats cheese known as brunost was a little bit better conceptually than in execution. Coffee and tea made from local leaves and berries (raspberry, etc) was served. 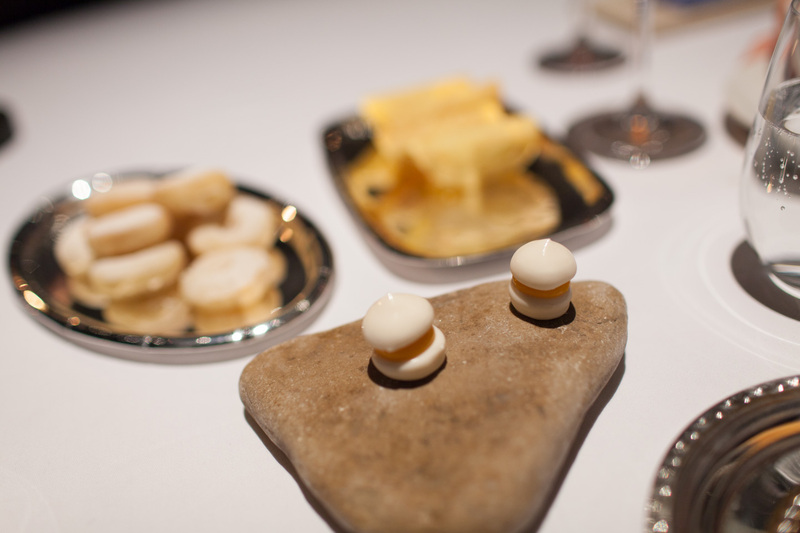 The very final piece of the dinner was a frozen fresh cheese with sea buckthorn made to look exactly like the very first dish. Frozen fresh cheese with sea buckthorn. There’s no going around that Maaemo is expensive and that the little extras add up as well; table made coffee (roasted by Tim Wendelboe) for 80 NOK, sparkling water at 95 NOK per bottle. Our total, for two persons, was 7530 NOK. Staff is expensive in Norway and this is a labour-intensive type of cooking and serving. But you do get an exceptional experience that can’t be replicated anywhere else and it’s not that out of line when compared to the grand tasting menus of other two-starred Michelin restaurants. 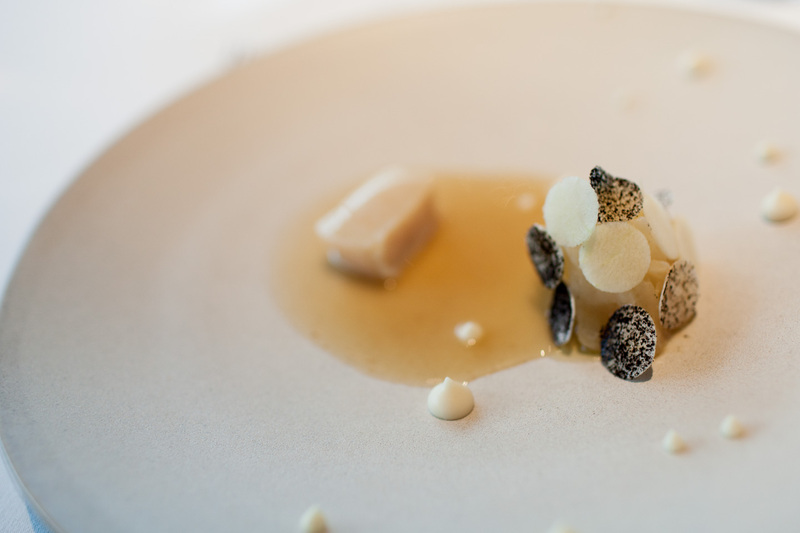 The harsh and spectacular nature of Norway is unique among the Nordic countries and Maaemo brings that to the plate. 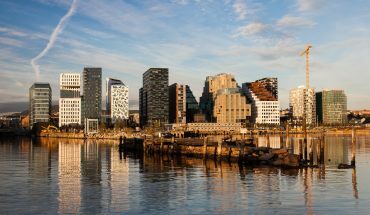 The technique, craftsmanship and concept behind every dish is just spot on and truly brings the traditional cuisine and spirit of Norway to the modern part of the country that is unafraid and pushes forward. The Geirangerfjord and Ålesund meets Barcode and Tjuvholmen, that’s what I see and taste when I eat the scallops with celeriac, the oysters and mackerel. The highlights are incredible and there’s nothing that really let’s the menu down, even if you normally don’t particularly care for certain types of food. The focused nature of each dish is both a plus and a minus; it really brings the Scandinavian mindset to the plate but it also makes it impossible to create the grandest multi-sensational dishes. But then again, these dishes are like a fine glass of wine, you don’t need anything else.